Ask any QEMSC member to name the top couple of bikes they lust after and Brian Fleming’s Norton /Jap would be right up there. Hand-crafted between 1996 and 1999, this is a bike to keep an eye on at top-level historic meets throughout Australia. A founding QEMSC member and “veteran” historic racer, Brian’s first meeting was back in 1979. 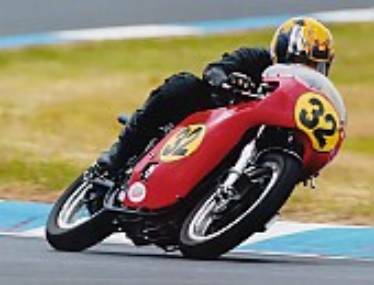 He started on a B33 BSA, which evolved into a very fast 350 that he campaigned through to 1999. The Norton/Jap project started with the sale of another 350 BSA racer in 1995. Cashed up and eager, Brian started designing and collecting the bits to create a very special historic racing motorcycle. An old Jap speedway engine under the house was assessed as a very good starting point for combining fast and reliable propulsion with the most desirable period frame – a Manx featherbed of course. Bryne Payne was commissioned to build a new frame, while a five speed AMC cluster was sourced from Bob Jolly in SA to slot into a racing AMC gear case. Then the real work started. Unfinished crankcase castings were sourced from Dave Basham in SA and finished off by Brian under the watchful eye of Mike Farrell. A Carillo rod and Wiseco piston were fitted to a long-stroke Jawa crankshaft (new of course), and a Cooper alloy barrel was sourced. This engine was built to be bullet proof – brand new from the bottom to the top – almost. That old Jap motor under the house turned out to be useful after all and on went the old cast iron head and valve gear (new valves and springs of course). Finished off with a 35 mm SS1 Delhorto, new Jap-grind cam from Ivan Tighe, a primary belt drive and NEB clutch, alloy tank, fairing, roadholder forks (oriental internals of course), twin-fire SR1 magneto, alloy rims, a set of Avons etc. etc. etc. (Hey! What happened to all that money I got for the BSA??) and in 1999 the bike was ready for its first outing – the Aussie champs at Queensland Raceway. First impressions were: Wow! Great power and handling and an unbelievable spread of torque. Unfortunately a nasty rattle while at idle in the pits put a quick end to the week-end. The problem was traced to a valve seat falling out (so much for that old head) which had set about destroying the piston. New valve seats and piston in place and Eastern Creek for the 2000 Aussie champs was the next challenge. Would you believe it – first race and a holed piston. Brian had taken a bit much off the top trying to get compression down to a civilised 13.5:1 and paid the penalty. From that point on, Brian has never looked back – except at the rest of the field that is. The bike has proved to be exceptionally fast and reliable. Those of us lucky enough to ride it have been blown away by the continuous feed of power. Brian has campaigned the bike at Lakeside, Phillip Island, Eastern Creek and Morgan Park. The real buzz is mixing it with bikes of real racing pedigree and coming out on top. He has never felt the need to change the gearing, or anything else for that matter – perfect for every track.